The South Berwick - Eliot Rotary Club is proud to welcome another Interact Club. Our successful and active Interact Club at Marshwood High School, led this year by enthusiastic advisors Grace Jacobs and Carolyn Maugher and a team of hard-working officers, has provided community and global service in many ways and we are so proud of them. This year, Berwick Academy in South Berwick chartered its service club to join the ranks of the Rotary Interact clubs. Advisor Jen Onken and a group of approximately 100 students are out and about serving the community and helping in global projects all year long. 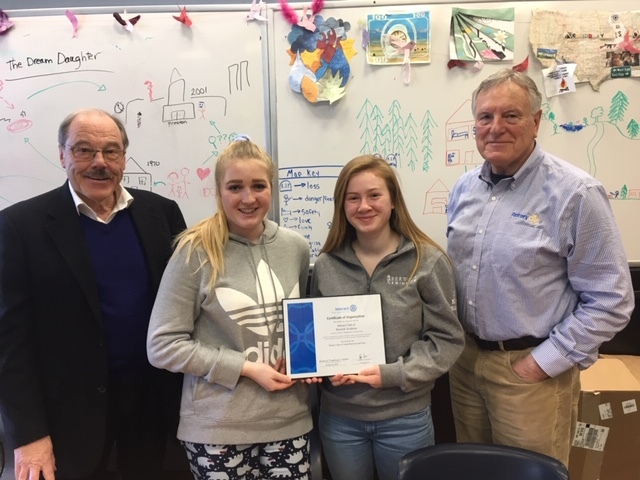 Now they are also benefiting from the support of our Rotary club to broaden their experiences, including taking part in the Interact United Nations trip and sending students this coming June to the next session for the Rotary Youth Leadership Award (RYLA) camp in Raymond, Maine. Pictured below, from left to right, Rotary Interact Club liaison and past president Skip Cousens, co-presidents Greta Lincoln and Robin Orr, and current club president Richard Donhauser, presenting their charter to Berwick Academy.